FEC data has strange characters representing negative numbers. Weeks ago news organizations reported the campaign donation totals reported by the six candidates vying to replace U.S. Senator Kay Bailey Hutchison, who's running for governor. 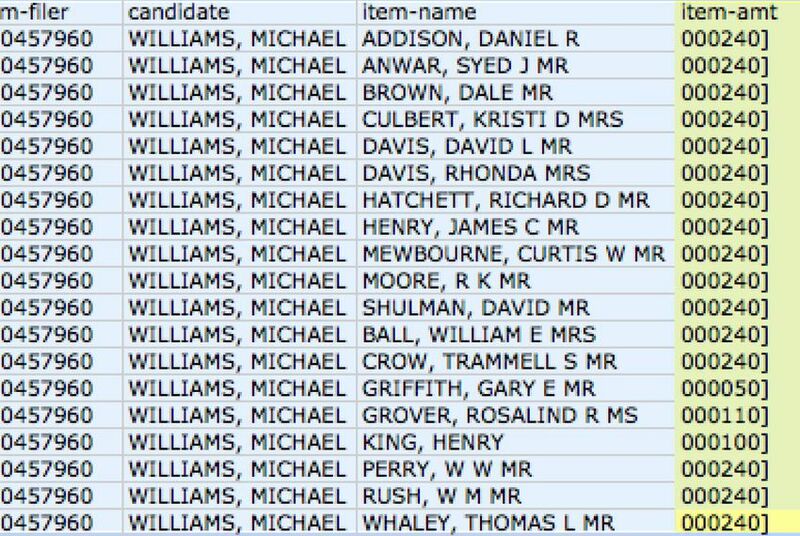 But what isn't yet accessible to readers are searchable records for individual and political action committee donation records, which show the contributors' name, city, state and more. That's because senators and senate candidates aren't required to file their campaign-finance reports electronically to the Federal Election Commission. Instead they file paper reports with the Senate. Those pages are then mailed to the commission, which hires a contractor to type all the records into a database. That process isn't finished until weeks after the quarterly filing deadline. Even after the delay, there are more problems. The commission allows anyone to download records for the entire country on its FTP site. But it still relies on a COBOL-based database, which places funky characters in the amount totals that have to be converted with programming. Contribution dates are also split. Making the records usable takes the National Institute for Computer-Assisted Reporting, for example, about 17 hours. Bottom line: You'll be able to search the latest senate filings in our database soon (I hope).